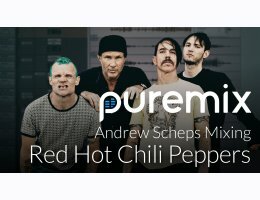 This is your chance to see how Grammy-winning engineer/producer Andrew Scheps mixed the legendary rock band Red Hot Chili Peppers' song Pink as Floyd. Learn how a multi-platinum mix engineer collaborated with the band and producer Rick Rubin to record and mix the group in both large-format studios and home studios. Hear how he captured the band’s characteristically funky and energetic vibe then translated that into a punchy and finished mix. Andrew teaches you how he applies and adapts his mix template to craft the mix quickly with dynamics and vibe. Take a mix from sounding "awesome" to sounding "finished"
BONUS: Download the exercise files and practice mixing the song for yourself! The artist and their label were gracious enough to allow pureMixers the chance to try their hand at mixing a portion of the song using the same raw multitrack stems Andrew mixed. Put your skills to the test and apply some of your new found techniques.